Golden Home Inspection: What is a Condominium Inspection, and Why is it Needed? If you are considering purchasing a condominium, it is a good idea to have a condominium inspection done for many reasons. Many people assume that a home inspection and a condominium inspection are the same, and this can be a big mistake. Condos have unique requirements, and differ significantly from homes because there are areas which are considered common areas that are used by all the occupants. Condominiums are similar to very upscale apartments, but they are purchased instead of rented. There is normally at least one association of owners, sometimes more, and this association can assess fees for the maintenance and upkeep of the entire building, including the roof, electrical systems, and anything other components that are shared by all of the unit owners. Normally the homeowners association for condominiums is responsible for the maintenance and repair of any component or area that is shared by more than one unit. A Condo Inspector Toronto will inspect all the common areas possible, as well as the individual unit, and asses the overall condition of both. A condominium inspection should be done to protect you if you are considering buying a unit. You should also carefully review the Home Owners Association Restrictive Covenants, because these will outline exactly what the HOA is responsible for and what the owners are responsible for if an issue arises. Some companies that do condominium inspections may only inspect from the interior drywall and in, and do not look at the exterior components of the building. This can lead to a false sense of security, because your unit may be in impeccable condition but the roof could have severe leaks and damage that may not be visible in other areas yet. 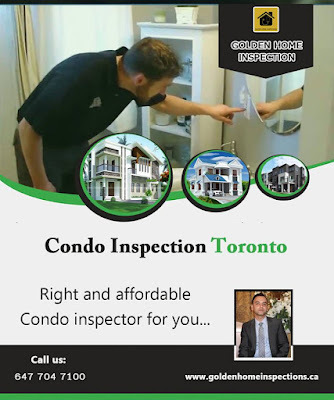 A Condo Inspector Toronto will inspect all components and aspects of the unit and the building, and this can save you a substantial amount if there are problems with any aspect of the building or unit. This should also include asking for permission to view the unit underneath the one being inspected, to ensure there are no water leaks or other problems that may not be visible in the unit. A Condo Inspection Toronto is the best way to protect yourself and your finances, and this should be done before you purchase any unit. A complete and thorough inspection will cover all areas that are common or that may affect the unit you are purchasing. Most associations receive an assessed fee for routine maintenance and upkeep, but unexpected or severe problems and replacements may result in additional assessments. All unit owners will share in the costs of common components and areas, and because of this an inspection should evaluate these things, to prevent a big financial burden later on. For an inspector to gain access to areas outside of the unit you are considering, you may need permission from the association of the building. Be wary of any deal that does not allow a thorough and complete condominium inspection, and if access is denied to the inspector you may be better off finding another unit in a different building.